Blackpool will once again take it to the deadline in their search of new faces today. Having initially stated he wanted his squad in place for the start of pre-season, manager Neil McDonald is still desperate for new faces and admits his group “simply isn’t good enough”. It means Pool have until 6pm to add permanent signings. The transfer window then slams shut until January, though loans deals are possible in the interim. But with Pool in the news for all the wrong reasons and rock-bottom of the League One table with one point from five games, McDonald admits it’s far from easy to recruit. “Blackpool haven’t won for a while, were relegated last season and have all the problems off the field,” he said. “Now we have problems on the field as we can’t win – that’s the most important thing. Pool had bids accepted for at least two players last week but couldn’t seal a deal. McDonald revealed: “The players we have targeted have decided not to bother coming. And after Saturday’s 4-0 hammering at the hands of Walsall, the reality of the task is hitting home hard for McDonald. 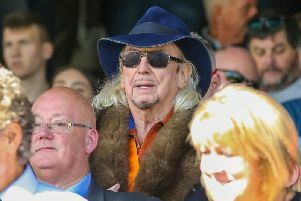 He has defended Karl Oyston, insisting the flak should not be flung at the chairman’s door, but it’s clearly a tough time for the Pool boss. “It’s difficult at the moment, of course,” McDonald admitted. “It’s got nothing to do with anyone else. I’ll take the brunt of all this. “We’ll keep on working. We can’t do anything else. “We have been back on the training ground and we watched through the whole video of the Wallsall game. “We can’t do anything but work hard in this situation – only hard work on the training ground will pull us through. “Yes, it would be nice to get some help and a couple of new faces, but it’s important we put the graft in and drag ourselves out of this.